Although Goya did not make his intention known when creating The Disasters of War, art historians view them as a visual protest against the violence of the 1808 Dos de Mayo Uprising, the subsequent Peninsular War and the move against liberalism in the aftermath of the restoration of the Bourbon monarchy in 1814. 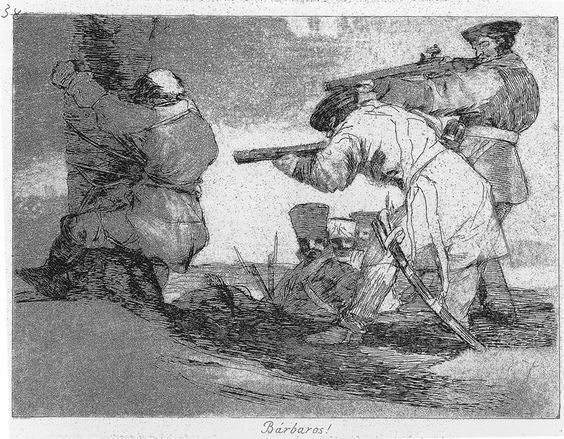 English: Los desastres de la guerra is a set of 82 aquatint prints created by Francisco Goya in the 1810s, and published in 1863, 35 years after his death. Otto Dix’s Der Krieg [War] 1924 is consciously modelled on Goya’s equally famous cycle of prints Los desastres de la guerra [The disasters of war], which detailed Goya’s own account of the Spanish War of Independence from 1808 to 1814.